Read the Campus Freedom Index here. Many find this counterintuitive. People expect threats to liberty and other progressive virtues to come from the academically challenged. We picture book-burners as knuckle-dragging dropouts with brows so low they’re obliged to view the world through their hairlines. The very organizers of Mr. Carpay’s breakfast say in their brochure that “traditionally, the university was a bastion of free speech” and “universities abhorred censorship,” adding that they did so “in the belief that the quest for truth was assisted by the clash of ideas.” The suggestion is that the university as censor is a recent and aberrant development. I’m afraid not. The origin of schools and scholars is ecclesiastical, not liberal, and bookish monks were looking for heresy, rather than the truth. Theologians thought of truth as being in their possession already, very much like climate activists today. Their quest wasn’t to find truth but to eradicate falsehood. What scholars saw as their task was to ferret out and destroy error. In their early days, universities resembled madrasahs far more than laboratories. Although this has changed, one doesn’t have to spend much time in faculty rooms (or, for that matter, in student cafeterias) to discover that a scholastic temper fits an inquisitor as comfortably as an experimental scientist, if not more. Scholars may be smart, but they aren’t necessarily tolerant, patient — or courageous. Philosophers have better centuries and worse centuries. As for the 21st century, with jihadists infesting campuses all over the world, we’re off to a rocky start. Saying that universities reflect the Zeitgeist is an understatement. Universities are more fashion conscious than Women’s Wear Daily. Academics go sashaying and flouncing like so many models on a catwalk in their ivory towers as they display the latest whim of the great designer, Intellectual Currency. Philosophers have better centuries and worse centuries, as the spirit of the times changes. The 18th century was good; the 19th century mixed, the 20th century baneful. Universities incubated both fascism and communism, along with their many sub-versions (pun intended). Although the great democracies defeated those two particular monstrosities in the end, it was a close-run thing and no thanks to their academic elites. As for the 21st century, with jihadists infesting campuses all over the world, we’re off to a rocky start. 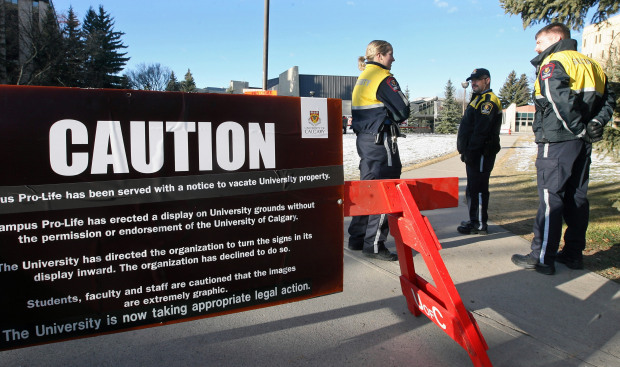 No doubt, today’s universities “empower their administrators and student union politicians … to censor expression on campus,” just as the Calgary brochure complains. But that’s no departure; it’s what universities do. They burn books or express solidarity with those who do. At Heidelberg, they did it for Hitler — but never mind Heidelberg. When Nazism was in vogue during the 1930s, trendy academics and administrators did it for Hitler even at Harvard or at New York’s Columbia University. As for Stalin, Mao and their successors, excusing suppression of speech was the least of it. There was hardly a Western university that didn’t justify, minimize, or apologize for mass murder as long as it was Marxist-inspired. If the battle of Waterloo was won on the playing fields of Eton, America’s campuses played a starring role in the loss of Saigon. When some brave souls associated with universities speak out against censorship, as they do on occasion, they’re the inspirational exception. The rule is an obedient dissemination of the dogma of the day, including terrorist chic, with Hamas apologists shouting: “No freedom of speech for racists.” I heard them do it at the Alma Mater of a noxious doctrine called “Israeli Apartheid,” a.k.a. University of Toronto. A Canadian institution of higher learning is the least likely place, I’d say, to encourage a clash of ideas to discover the truth. Greasing the squeakiest wheel of an intellectual bandwagon, then handing out honorary doctorates to those who hitch a ride on it, would be more of its speed. A Canadian institution of higher learning is the least likely place to encourage a clash of ideas to discover the truth. Earlier this year a provincial government commission, ominously named Working Group on Journalism and the Future of the News, and headed by a Quebec university professor, former CBC journalist Dominique Payette, recommended that the government license or otherwise qualify journalists. This, presumably, would split journalists into “professionals” and amateurs, the latter with reduced access, privileges and subsidies. While Charter provisions guaranteeing a free press wouldn’t permit the immediate exclusion of unlicensed journalists from practice the way unlicensed lawyers or doctors could be, it would undoubtedly be a step in that direction. Before long, writing an article or a column without proper “qualifications” could be a matter for the police. Next to separating the church from the state, the most important thing, it seems to me, is to separate the newsroom from the ivory tower. To protect whatever remains of a free society’s traditions and institutions — such as free speech and free press — we must protect ourselves from our universities. Even journalism schools attract the kind of politically correct conformity that is detrimental to bold inquiry, but turning news gathering and commentary into a profession requiring academic “qualifications” would put the lid on it. No real danger, some colleagues say. Canada isn’t China. Even China isn’t China anymore. By now, between these two statements, I have more confidence in the second.